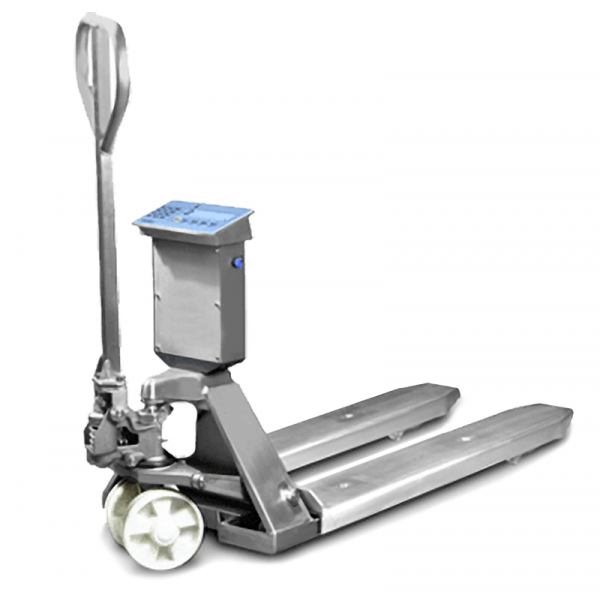 Product information "Stainless steel pallet truck scale HLS-D 2000 SS"
The pallet truck made of stainless steel with integrated scale is the ideal solution for simple, quick weighing operations in the food and pharmaceutical industry. Especially in logistics, the fast weighing without detours is advantageous. Lifting - Weighing - transporting. The pallet truck is simple in use and handling. High-contrast display with 25 mm LCD large display even in bad lighting conditions. The stainless steel pallet truck is absolutely robust and stable. Support frame and mechanics in stainless steel AISI316. Hydraulic pump made of stainless steel. Steering wheels and double roller wheels with paneling made ​​of nylon. Load cells and cabling installed protected inside the frame. The indicator with a 25 mm large, backlit display provides optimal readability of the weight, even in low light conditions. Capacity: 2000 kg as standard. Four high-quality load cells, which are installed inside the framework, ensure highest precision. These load cells with IP68 are certified to OIML. The indicator in a stainless steel housing with IP65 has a large 25 mm display. The tare function covers the entire measuring range. The pallet trucks with scales of the HLS-D 2000 SS series are verifiable according to the requirements of the International Organisation of Legal Metrology (OIML) and comply with the guidelines for accuracy class III. For applications that require verification, please order verification at the same time. Verification at a later date is not possible! The pallet truck is a two-range scale. A two-range scale changes automatically from the smaller in the next higher range when its under load. At zero return there is no automatic switching to the small digits step. Zero, tare, printout, high resolution weighing x 10, Net/Gross, summation, formulation , +/- tolerance weighing, percentages, piece counting (max. resolution of 1.500.000 divisions) HOLD function and peak detection. Its removable rechargeable battery provides a self-powered weighing and is ideal for weighing applications at different locations. The high endurance of the battery of about 80 hours (without printer) allows for flexible working. Optionally, the pallet truck can be equipped with an integrated thermal printer. Related links to "Stainless steel pallet truck scale HLS-D 2000 SS"